The Macedonia flag features a red background with a yellow sun in the middle. There are eight rays that extend from the sun. 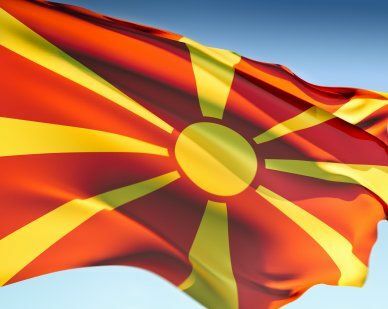 Macedonia gained independence from Yugoslavia on September 8, 1991. Between 1991 and 1995 they had a flag that used Alexander the Great's Star of Vergina. Greece objected to the use of this flag as well as the name of the country since there was already a providence called Macedonia in Greece. The Greek officials feared that the new Macedonia would try to take over their province. The new flag was adopted on October 5, 1995. Our top-quality Macedonia flags conform to all official specifications. Emblems and designs are executed with the highest possible degree of accuracy in regard to detail, color shades, placement and proportion to flag size. Our world flags are extremely durable, fast-drying, and boast brilliant, fast colors. These flags are also finished with strong canvas headings, reinforced stitching and large metal grommets. Available in a variety of sizes from AmericanFlags.com and ready for immediate shipping to your door.